Tracking forest communities (via species abundances) in various forest plots across time. I performed NMDS (using nmds() in the R package Ecodist), and then added change vectors to my ordination. Note: each point in my resulting ordination represents a forest plot in a given year, and change arrows connect the points of each consecutive sampling year for each given plot. I also performed a hierarchical cluster analysis (w/ flex beta), and subsequently colored my points in the ordination based on the cluster analysis results. So if you'll notice, the forest plot in the bottom right corner changes minimally in all but a single year. In that year, the NMDS point is drastically different than in all other years -- it's located all the way toward the top of the NMDS output plot. Normally, I would see this trend and assume something drastic happened that year. 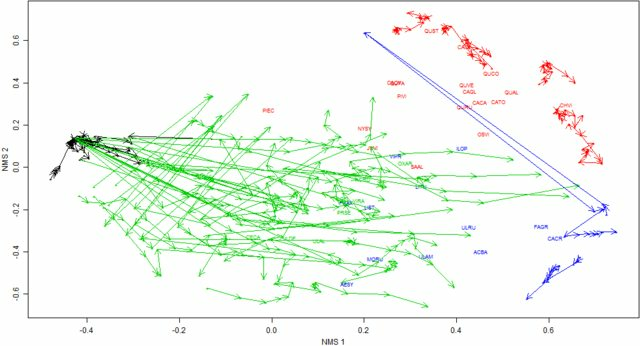 I would assume that the plot's overall species characteristics matched the plots represented by red dots on the top more so than the plots associated with blue dots toward the bottom of the ordination graph in that one given year. When I actually examine the raw data for this forest plot in the years leading up to, including, and after the massive shift in NMDs space, I find that basically nothing changed between years (especially between the drastic change year and the sampling years immediately before and after). In other words, the same individual trees (of the same species and with the same relative distribution of sizes) existed in this massively different year as in the years before and after it. So I know that NMDS isn't perfect and can get stuck in "local" minima etc etc... However, after running 1000 ordinations, I would think my results would be robust enough to avoid such issues. But maybe it's still possible? So, is this anomaly possibly still due to some random chance issue in the algorithm itself? If so, is there any way for me to determine the cause?? Lastly, I have re-run this ordination a hand-full of times (each time with slightly different input), but each time some plot seems to have a weird "outlier " point that doesn't make sense like above. So I'm beginning to think maybe this is something that I won't be able to eliminate or account for. Is there a way to describe the phenomenon? More importantly, is there precedence for simply excusing an anomaly like this as an artifact of the NMDS approach and just moving forward with the present result? examples or suggestions of how to word such an explanation would be appreciated. Browse other questions tagged multivariate-analysis multidimensional-scaling anomaly-detection or ask your own question. Which data mining packages support anomaly detection? Identifying clusters/ordination based on correlation statistic?